Children's Stories - I’m Having A Bad Day! Molly was having a bad day. When she got out of bed, she stepped on her favorite doll and broke her head off. When she went into the bathroom to brush her teeth, she dropped the lid to the toothpaste. It rolled onto the floor. She couldn’t find it anywhere, even though she crawled around on her hands and knees looking for it. She dropped her breakfast plate on the kitchen floor. The scrambled eggs splattered all over the refrigerator and one of her pancakes flew up to the ceiling and didn’t fall back down. It stuck there with the sticky syrup dripping down onto the floor. At school her pencil broke in half. She tripped at recess and skinned her knee and Billy McKeon put a grasshopper on top of her head. "I’m having a bad day," she cried, throwing herself on her bed. "What’s the matter, Molly?" her mum asked. "You’ve only been home from school for five minutes." Molly couldn’t stop crying long enough to tell her mum. "I know what will make you happy. Come with me," her mum said. They walked down the street to the park. Mum pushed Molly on the swings. "Wheee! This is fun," Molly giggled. They took their shoes off and played in the stream, took turns sliding down the slippery slide, and chased butterflies. Both of them ate a strawberry-banana-chocolate-bubble gum ice cream cone. It dripped from their chins on to their clothes, but Mum didn’t mind. Hers was messy too. 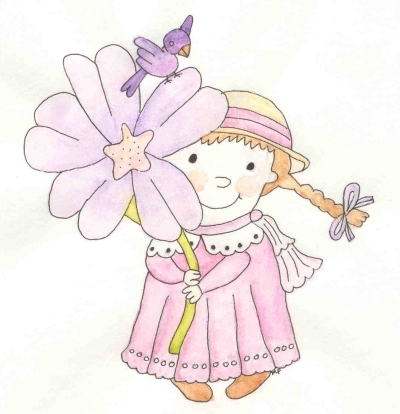 "This is for you," her mum said, handing Molly a pretty purple flower with big petals. "Do you feel better now?" "Yes, Mum," Molly smiled. She slipped her hand into her mum’s and they skipped all they way home.